As industries ranging from food to e-commerce grow increasingly competitive, recommendations have become a crucial mechanism to maximize revenue and user engagement. By providing consumers with personalized recommendations based on their previous purchases or search history, companies encourage users to spend more time browsing their websites or apps, and may even convince them to make additional purchases. But as complex as recommendations may seem, they don’t have to be; with Redis, your company can launch a simple recommendation engine in no time at all. Any effective recommendation engine should be efficient with system resources, guarantee high performance with real-time updates and generate accurate, relevant choices for its users. There are a few types of recommendation engines that are especially common: those that offer recommendations based on user interests, those that rely on collaborative filtering and those that supply content-based recommendations. No matter what type of recommendation engine your company is looking to build, however, Redis likely has the perfect solution. Redis supports a diverse range of data structures and commands that can significantly reduce application complexity while simultaneously delivering consistently high performance, even on a large scale. Moreover, because it is an in-memory database, Redis delivers very high throughput with sub-millisecond latency, using the lowest possible number of computational resources. 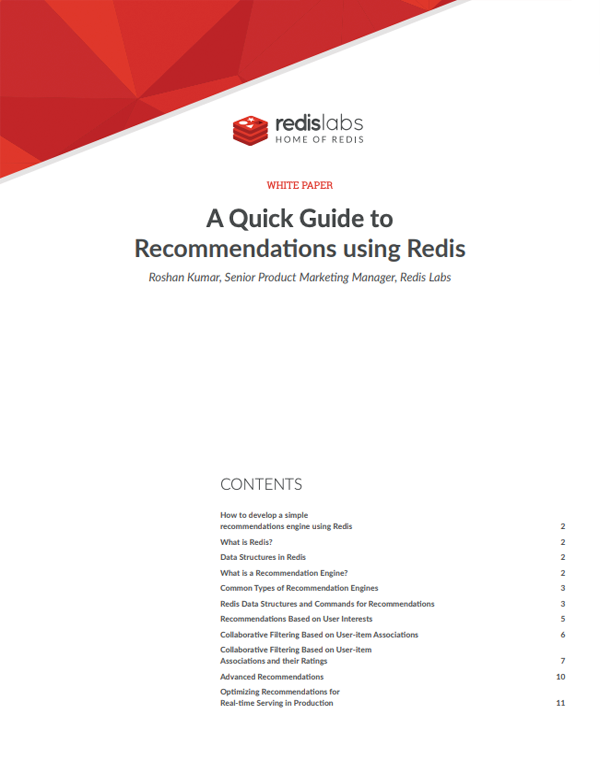 Download our white paper to learn more about how Redis is uniquely suited to delivering recommendation solutions. Within Redis, Strings, Sets and Sorted Sets are all particularly useful data structures when it comes to constructing a recommendation engine. Redis commands enable anything from the addition of multiple sets to the incremental iteration of sorted set elements and their associated scores. The complete list of relevant commands, which is available in this white paper, can be used to generate a set of recommendations as generic or as specific as you might need. For example, Redis commands like SADD and SMEMBERS will help your app come up with a set of recommendations based exclusively on user-specified interests, while commands like ZADD and ZUNIONSTORE will yield a much more specific recommendation list, based on user-item associations and their ratings. Redis is also capable of providing more advanced recommendations. If you want to provide interactive, content-based recommendations, for instance, you might want to take advantage of the machine learning capabilities available in Redis-ML, which offers categorizing techniques using tree ensembles like Random Forest. Regardless of how complex you want your recommendation engine to be, Redis can usually perform all the computation required, and may even help you determine how best to deliver recommendations. To get a better understanding of how to optimize real-time recommendation algorithms in Redis, please download our white paper.